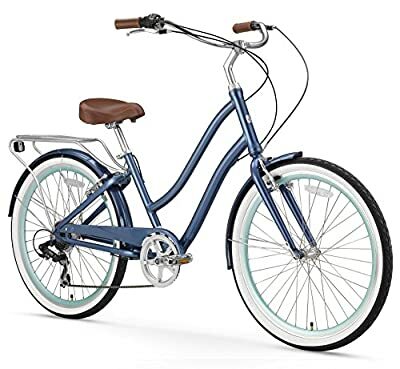 Are you a lady who’s looking for a comfortable bike that you could use to go around your daily duties? It could be going to school, work or even for leisure rides. Then the best hybrid bike for women will surely give you the best services ever. Hybrid bikes are designed in a way in which all the futures of touring bikes, mountain bikes, and road bikes have been combined into just one bike. This makes the bikes versatile with the ability to be used in any kind of environment. Regardless of the riding conditions, the level of comfort that these bikes offer is kept intact. 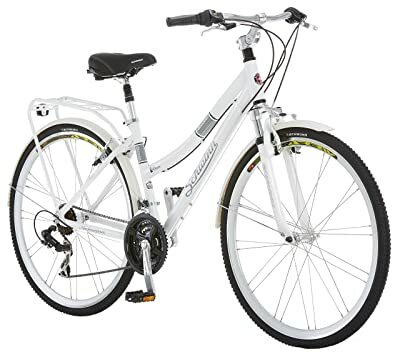 But I for sure know how busy women are; to them even finding time to search for a hybrid bike can be quite difficult. To make your search for a hybrid bike easier, I’ve put together this great piece and without any doubt, it’s what you’ve been looking for. Without wasting much of your time, let’s hit the ground. 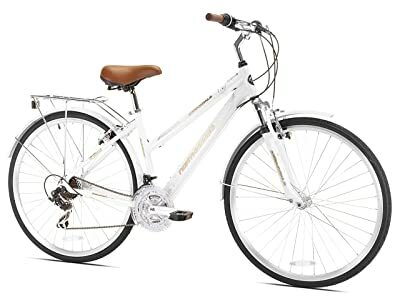 This is probably one of the best hybrid bikes for women you can come across currently in the market. It is a very versatile bike designed with a 17.5” aluminum frame. It is therefore, perfect for commuting and leisure. Its riding style is upright which ensures that your shoulders and back are kept comfortable. Besides, it allows for proper leg extension as a result of its foot-forward design. Its tire diameter is 26 inches with a width of 1.95 inches all of which ensures that you are well-cushioned and stable as you ride. The tires are semi-slick with white walls making the bike stand out. The frame that houses this bike is curvy and stylish. It also has a dual-spring saddle which contributes a great deal to your comfort as you go about your riding business. This bike also comes with matching fenders as well as a rear rack that you can use for carrying panniers and baskets as you go shopping. It is designed with friction shifters which together with the 21-speed Shimano Tourney Derailleur makes sure that you tackle even uphill areas and long distances with a lot of ease. This bike also has rear and front handbrakes which add to your safety. Being that the bike is made of aluminum, this means that it is lightweight and therefore, easy to maneuver even along bends and corridors. It is perfect for riders who are between 5 and 6 feet tall. The bike weighs 38 pounds after complete assembly. The Schwinn Discover bike is another great one that you can always find in the market. It has a classic look; isn’t that what most women look for in their products? Its aluminum frame is designed in a manner that makes it most suited for urban riding. These bikes have front suspension forks which ensure that you enjoy your rides without feeling pavement patches or manhole covers. It also has a rear rack onto which you can carry your groceries when you’re from the market or even your bags. The good thing about this rack is that it’s built in. It is also built with coordinating fenders which will keep the morning dew away from splashing onto your clothes. The fenders might appear snazzy but believe me, they are very necessary. Another good thing about this bike is the 21-speed with Shimano shifters and rear derailleur which it has been built with. It also has a rear liner and ally front pull brakes that ensure that your safety is guaranteed at any given time. This bike’s handlebar design is a swept-back one that keeps you upright due to its adjustable stem. To add onto the comfort provided by the upright position, there is a padded saddle that doesn’t make you feel fatigued as you ride your bike. What’s more, this 46-pound bike has been in the market for 14 years and can therefore, be trusted. Do you like riding along pavements? Then the Sixthreezero Pave N’ Trail bike is a good choice for you. It is simple, sleek and clean which is irresistible for women. The bike ensures maximum comfort is achieved during riding as a result of its front suspension forks made from Vibrazorb technology. This reduces vibration as well as any shock when you happen to visit rougher terrains. Additionally, its handlebar positioning plus the geometry of the frame keeps you upright, therefore, eliminating pressure that could have built on your shoulders and lower back as you ride. This hybrid bike ensures your comfort levels are met without compromising on its performance. It is a 21-speed bike that makes use of the EZ Fire plus Shifter and Shimano Tourney derailleur technology. This makes it a perfect bike for tackling the most demanding trails and long distances. For precise stopping, the bike has rear and front handbrakes that you can always rely on when the need arises. The other good thing about this bike is its frame that is low profile hence allowing for easy exit and entry. Do you wish to go shopping with your bike? Then this hybrid bike will serve you better since it has a rear rack that you can use to carry panniers and baskets. This bike is ideal for riders who are between 5’ 4” and 5’ 10” tall. What’s more, the bike is lightweight and weighs only 33.5 pounds. This bike’s frame has been made from steel which makes it durable. It allows for upright riding as a result of its True Comfort geometry that is more or less a natural posture. This bike is designed with a Step Thru design that allows get to on or off with a lot of ease. It is a 7-speed bike with a comfortable seat. This together with the riser handlebar will make you ride for long distances without feeling fatigue. Its 27.5-inch tires are wide enough to offer both stability and smooth rides even on bumps. This hybrid bike is available in different sizes from small to large. This means you’ll definitely find something that fits you whenever you are in the shops for a hybrid bike for women. The Big Shot hybrid bike is available in different fashionable colors that surely match your accessories. Its high tempered steel frame means that it is durable and will serve you for quite a long time. The beautiful bike is also equipped with rear and front caliper brakes that ensure that you are safe at any given time. The flip-flop hub means you can only ride it in just one speed/fixed gear. The frame is slim and hence less bulky. Besides, it is sleek, efficient and requires very little maintenance. The fixed speed and the sophisticated construction make the bike more versatile. Its bullhorn bars will keep you uptight as you ride and at the end of the journey you’ll feel as if you didn’t even ride as a result of the comfort it offers. Started in the year 2009 to help women riders, Big Shot bikes haven’t disappointed since then. The bikes are available in small, medium and large sizes. The Deep V rims which are 43mm are also a great feature on these bikes. 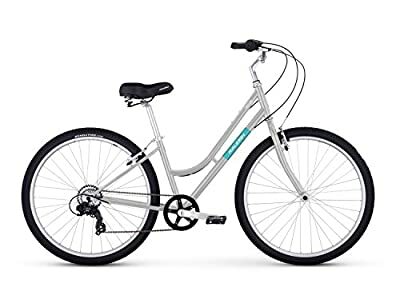 The Kent Northwoods hybrid bike is made of lightweight and hand-crafted aluminum frame that makes it easy to maneuver. Their700c tires are meant to make them stable and comfortable to ride. The bike is designed with Shimano Tourney derailleur on its rear side to offer 21 different speeds. These speeds are easily adjustable regardless of the kind of terrain you are riding on. Additionally, it is made with linear brakes that can be pulled with a lot of ease to cause a stop. This women bike is also fitted with rise ergonomic handlebars that keep you upright as you ride making you feel comfortable. It comes with a seat clamp that can be quickly released. What’s more, it has alloy rims, fenders as well as a rear rack. It is also not very heavy and weighs only 42.5 pounds. Nothing is as hectic as sifting through various models and brands of bikes just looking for one that will suit you. It can actually take you hours and sometimes even days. 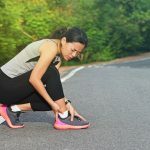 If you happen to be in a hurry to get one then this guide will be of greater importance to you. What should you look for in a hybrid bike for women? 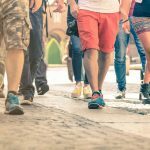 Take a look at some of the important features you should pay attention to. The frame is the most important component of any bike. Why do I say so? This is the part that holds the rest of the bike together. The material used to make the frame should, therefore, be strong enough for the bike to be durable. Who really wants to buy a bike that will break down after a very short period of time? Hybrid bikes are designed to operate in different kinds of environmental conditions. As a result, the materials from which the frame is made need to be strong enough to withstand the different conditions. Hybrid bike frames can be made from carbon filters, aluminum or steel. These materials have their own merits and demerits. Aluminum frames, for example, are strong and durable and at the same time resistant to corrosion and rust. These are great qualities that any good hybrid bike for women should be associated with. Besides, the aluminum frames are lightweight which means you won’t require much energy to ride the bike. The aluminum-made bikes can also be easily transported from one place to another due to the lightweight. Aluminum-made bikes are also affordable and have shock absorption properties which ensure that the probability of you sustaining injuries in the course of your riding is kept low. Hybrid bikes made from carbon fibers, on the other hand, are expensive. Such bikes are what you often see tycoons ride. Are you yet there? Well, you can try these bikes out if you can meet the price. Carbon fiber bikes are however the lightest and the strongest. They are the smoothest to ride furthermore. Thirdly, is steel which is very strong but a little heavier than the above two materials. The rides from bikes made from steel are comfortable and smooth. The material is however prone to corrosion and rust. Of the three materials, the choice is yours to make. Mountain and racing bikes often have their seats above the handlebars. What of hybrid bikes for women? Should you go for the bikes with the same handlebars as the ones above so that you lean forward as you ride? These questions make the position of handlebars another area that should be looked into during the purchase of a bike. Most hybrid bikes have the bars higher than the seats which yields a lot of comfort during riding. This helps in increasing wind resistance resulting into less power applied to the bike’s pedals. It is for this reason that you find most hybrid bikes comfortable to ride. Flat Bar – This type of handlebar gives a relaxed riding position. Besides, they allow you to have a clearer view of the road and terrain with a lot of ease. Drop Bar – With this bar, you will ride in a low position but in an upright posture. Moustache Bar – This is just a combination of drop and flat bar which is straighter and at the same time curled allowing for riding in different positions. Riser Bar – These are extended upwards before curling towards you in the backside. They offer some comfort. The size of a hybrid bike’s wheels usually corresponds to the frame size of the very bike. A large bike comes with large wheels. 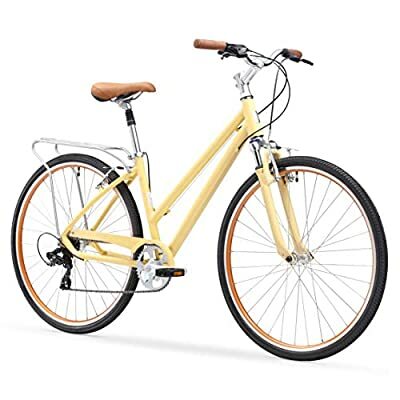 Hybrid bikes for women are usually made with the standard 26-inch or the 700c wheels. The 700c wheels are the best for road riding due to their thinner structures. They can be used in slightly flat terrains. The 26-inch wheels on the other hand are well suited for off-road riding. The latter is more stable at slow speeds. 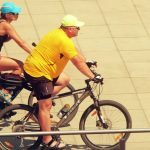 Your height should actually dictate the size of the bike frame that you should go for. This by extension affects the wheel size of the hybrid bike of your choice. Your safety is another aspect that you really need to pay close attention to whenever you’re in the market for a hybrid bike. When I talk of safety, what should come to your mind are brakes. There are two types of brakes found on hybrid brakes; rim and disc. Rim brakes are where rubber pads are designed to directly grip onto wheel rims causing a stop. Disc brakes include brake motors mounted at the back and front wheel hubs. Brake pads hold on to rotor causing a stop. Disc brakes are either mechanical or hydraulic. Disc brakes are the best as they are cheaper to replace besides providing consistent power needed for stopping the bike. However, disc brakes are more difficult to service. The other safety feature is on the seats. The seat should have suspension for shock absorption when riding in rough terrains. The seats should also be well-cushioned to provide comfort. It is the type of gear that your bike has been designed with that will determine the type of terrain that you can use it on. Lower-geared bikes are usually easy to pedal thus making them the most ideal for terrains that might need some kind of climbing. Higher gears, on the other hand, are often characterized with high resistance and can therefore, be used for high-speed riding. But again, how many gears should you look out for in a hybrid bike for women? If you’ll happen to use the bike on flat terrains most of the time then a few gears will be okay for you. If the terrain is rough and steep then you need to go for a bike with many but low gears as such are extremely versatile. 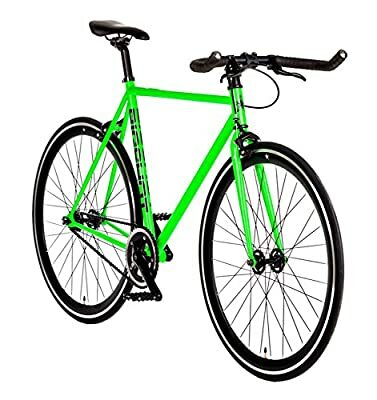 Unlike hybrid bikes which can be used on both the roads and mountains, road bikes are specifically designed to be used for fun along paved roads. Hybrids are a bit luxurious compared to their road counterparts. Road bikes can be used for long-distance commuting from place to place. Hybrid bikes are heavier compared to road bikes. The difference in weights is often as a result of the use of heavy, big wheels and frames on hybrid bikes. This is one notable difference you can easily find in these two types of bikes. A hybrid bike’s seating position is more upright compared to a road bike, even the most sportive one which is usually designed in an upright position that is a bit relaxed. This usually leads to a more relaxed and easier ride. Hybrid bikes being a cross between mountain and road bikes have more components compared to purely road bikes. Some of the additional components you’ll find in a hybrid bike are the suspension forks. Riding bikes isn’t a preserve for men alone. 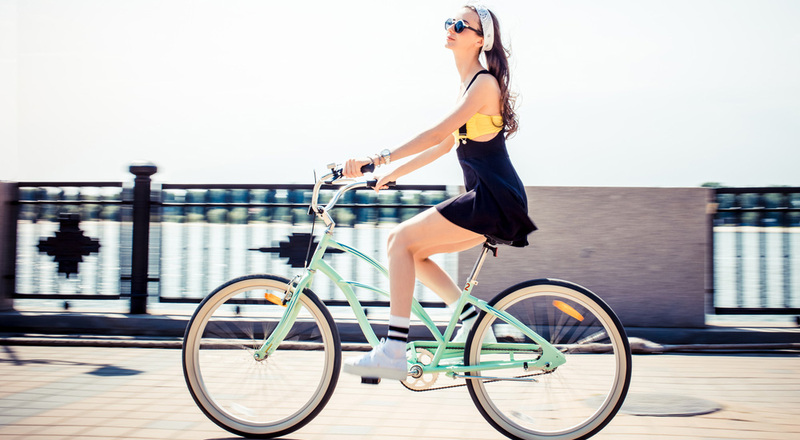 Women can also enjoy riding bikes, and most importantly, the hybrid bikes as such are the only way women can go about their everyday activities. What has kept women away from enjoying riding bikes is the fact that finding bikes to meet their needs has been a bit difficult. With this piece, however, that is a matter of the past. Of the products reviewed, Sixthreezero EVRYjourney is the best hybrid bike for women. This bike is versatile, comfortable to ride, stylish, lightweight and durable. These are just but a few of the many merits of this bike.